Robert Kiyosaki is best known as the author of Rich Dad Poor Dad—the #1 personal finance book of all time—which has challenged and changed the way tens of millions of people around the world think about money. Rich Dad titles hold four of the top ten spots on Nielsen Bookscan List’s Life-to-Date Sales from 2001-2008 alone. Robert has been featured on shows such as Larry King Live, Oprah, The Doctors, Bloomberg International Television and CNN. With perspectives on money and investing that often contradict conventional wisdom, Robert has earned a reputation for straight talk, irreverence, and courage. His point of view that ‘old’ advice—get a good job, save money, get out of debt, invest for the long term, and diversify—is ‘bad’ (both obsolete and flawed) advice, challenges the status quo. His assertion that “your house is not an asset” has stirred controversy but has been proven to be accurate in our economy’s current financial crisis. In 2006, Robert teamed up with Donald Trump to co-author Why We Want You To Be Rich—Two Men—One Message. It debuted at #1 on The New York Times bestsellers list. Robert writes a column, “Why the Rich Are Getting Richer”, for Yahoo! Finance. He was also featured in TIME Magazine’s popular “10 Questions” column where Robert answers questions ranging from investing with few resources to the impact of education on one’s financial success. Robert’s latest book, Conspiracy of the Rich: The 8 New Rules of Money, pioneered online book publishing as a free online interactive book with contributions from 1.1 million readers in over 167 countries. Frequent updates and postings appear on ConspiracyOfTheRich.com. And he recently completed a mini-documentary, Shooting the Sacred Cows of Money, centered on debunking the destructive myths about money and teaching the 5 essential elements of financial education. The film can be viewed for free at ShootingTheSacredCows.com. A large part of Kiyosaki’s teachings focus on generating passive income by means of investment opportunities, such as real estate and businesses, with the ultimate goal of being able to support oneself by such investments alone. In tandem with this, Kiyosaki defines “assets” as things that generate cash inflow, such as rental properties or businesses—and “liabilities” as things that use cash, such as houses, cars, and so on. Kiyosaki also argues that financial leverage is critically important in becoming rich. 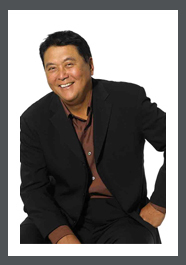 Kiyosaki stresses financial literacy as the means to obtaining wealth. He says that life skills are often best learned through experience and that there are important lessons not taught in school. He says that formal education is primarily for those seeking to be employees or self-employed individuals, and that this is an “Industrial Age idea.” And according to Kiyosaki, in order to obtain financial freedom, one must be either a business owner or an investor, generating passive income.